Cryo-electron microscopy can determine the structure of biological matter while force spectroscopy adresses their mechanical properties, but is usually limited by thermal fluctuations. 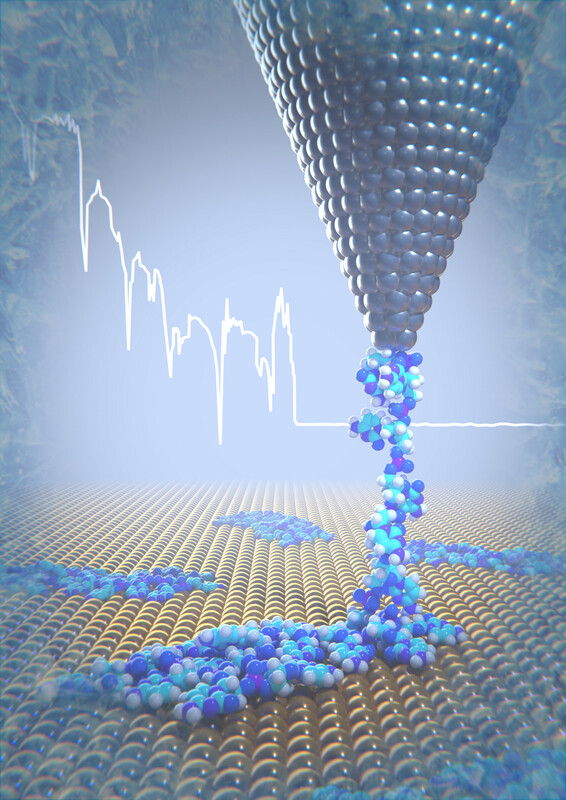 Here we combined measurements in cryogenic conditions and computer simulations to characterize the structure and mechanics of single-strand DNA adsorbed on gold down to the sub-nm level. Our paper published in Nature Communications 10, 685 (2019) can be read from https://www.nature.com/articles/s41467-019-08531-4. So far, force spectroscopic experiments on biomolecules using optical tweezers or AFM were conducted under ambient conditions in solutions, mostly up to few tens of pico-Newton tensile loads. Mechanical properties are then limited by thermal fluctuations and folding/unfolding of soft parts of the molecule. In our study published in Nature Communications, we used a low temperature AFM to image individual 20-Cytosine single-strand DNA (ssDNA) adsorbed on a gold surface down to the sub-molecular level. In analogy to “cryo-electron microscopy” that determine the structure of biological matter in vitrified liquids (Nobel Prize in Chemistry 2017), we demonstrated that cryo-force spectroscopy can detect the intra-molecular mechanical responses of “frozen” ssDNA during a pulling experiment. The ssDNA molecules were adsorbed onto the substrate kept in ultra-high vacuum using a spray-deposition technique. We resolved by high-resolution AFM imaging with CO-terminated tips individual folded ssDNA oligomers having length of 4-5 nm as well as their self-assemblies. First lifting experiment. The AFM apex is approached to the end of a single oligomer until a tip-molecule bound is formed. Then, the tip is retracted, the oligomer should in principle follow and be lifted from the surface. One, two nanometers. The process is interrupted due to of the premature detachment of the molecule from the tip. Many attempts later, we reached a maximum lifting height of only half the adsorbed molecule length. The ssDNA always reattached to the surface. Nevertheless, the force-retraction curves revealed sub-nanometric features and a striking reduction of the stiffness as we lift. Dr. Guilherme Vilhena then performed extensive molecular dynamics (MD) calculations of the ssDNA adsorption and pulling experiments. In simulations, the folded oligomer fully detached when the tip has been retracted by about 12 nm! A length corresponding to a fully stretched ssDNA molecule. Looking at the MD movies, we immediately figured out that the oligomer was peeled off similar to an adhesive tape, reflecting the strong ssDNA adhesion to the gold substrate. Rather than a drawback, this turned out to be an advantage. Comparing theoretical and experimental force curves, we estimated that the pulling stretched the lifted ssDNA segment with an average tension of about 2 nN, value 10 to 100 times higher than hitherto applied in most single-molecule force spectroscopy studies under ambient conditions. For the curves, we also extracted using a spring-in-serie model the intrinsic stiffness per repeat unit of fully stretched ssDNA (~33 N per m) only few nanometer long. In future experiments, we will focus on tuning the DNA adsorption. We believe that this might enable the complete lifting of linearly adsorbed oligomers and permit a meaningful statistical analysis of their detachment. We also think that cryo-force spectroscopy might enable single-base distinction in DNA from their mechanical response. This work is the result of an intense collaboration between the experimental group of Prof. Ernst Meyer (University of Basel) and the theoretical team of Prof. R. Peréz (Universidad Autonoma Madrid). We were fortunate to have the invaluable theoretical supports of Prof A. Baratoff and Prof. E. Gnecco as well as the experience of Dr. A. Hinaut in electro-spray deposition.